Due to diabetes, circulation in the extremities like the legs worsens which is why quality socks designed for the diabetics are important to overall health and comfort. 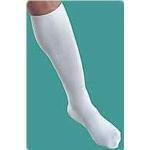 We carry two of the best brands of diabetic socks- Mediped and Therefirm. The Mediped Crew and Quarter socks are non-binding on sensitive legs & ankles. Mediped’s Extra Wide Funnel Top reduces pressure on legs and ankles and soft cushion soles and smooth toe seams prevent foot irritation & abrasion. The socks are available in various colors and sizes to fit both men and women. Therafirm’s SmartKnit socks are ultra-smooth, with no compression or circulation restriction. Designed purely seamless with a soft stretch in every direction and moisture managing antibacterial fibers. Medipeds Diabetic Crew Sock, Medium, Black. Womens Size 5-10 Mens 5-9. 51% Cotton, 36% Coolmax, 12% Nylon And 1% Lycra. Sold By Inner Pack Of 3 Pairs. Medipeds Diabetic Crew Sock Large, Navy. Womens Size 10-13 Mens 9-12. 51% Cotton, 36% Coolmax, 12% Nylon And 1% Lycra Sold By Inner Pack Of 3 Pairs. Smart Knit Seamless Diabetic Sock, Black, Medium. Sold By The Pair.